Edgar Wright is a masterful filmmaker. With only six films under his belt, the British aesthete has created what most directors spend their entire career chasing: a distinct, immediately recognizable milieu for his characters to inhabit. It takes all of two minutes to know you’re watching an Edgar Wright movie. But understanding space is not inherently a virtue: Just because you know how to navigate a Target does’t mean you want to spend time at a Target. In comedy-based filmmaking, though, familiarity tends to breed both adoration and comfort. This is why we accept sitcoms with recurring characters, set pieces, and iconography. The show begins, kicking off with a catchy theme song, and we submerge ourselves in these alternative universes. They make us feel good; they make us laugh. Good comedy is essentially a consistent hit of dopamine. We accept it into our bloodstreams and anticipate a subsequent injection, same time next week. A rarified talent, Wright has managed to elicit a similar call-and-response to his films. Sitting in the Paramount for the SXSW premiere of “Baby Driver,” you could feel the anticipation percolating. Funk and soul jams blaring through the loudspeakers; people talking, dancing, excited. The energy was infectious. By the time Wright left the stage after delivering a gracious introduction, the audience was enraptured. You know you have a crowd in the palm of your hand when a TriStar logo card is met with roaring applause. Then comes the opening scene, a banger of an action sequence in which our titular protagonist (Ansel Elgort, “The Fault in Our Stars”) circumvents police and physics in equal measure. It’s a master class in how to jumpstart a film: exhilarating, propulsive, dazzling. Wright swiftly moves into the interiors of Baby’s life. He’s a laconic, sweet kid who lives with his deaf foster father (CJ Jones). By day, Baby’s a beat-maker (a white J-Dilla), and by night he’s a getaway driver for a crime kingpin named Doc (Kevin Spacey). Like any heist film hero, Baby has one last job to do until he’s done paying off his debt to Doc. After that, Baby is leaving the game. For good. True to form, Wright relays this information without resorting to tedious exposition. A visual storyteller at heart, Wright keeps the proceedings moving quickly. The film’s first hour is essentially an elaborate car-chase musical, with action and dialogue synchronized to music. The attention to detail here is staggering. Sound effects seamlessly blend into the soundtrack, which includes gems by everyone from The Foundations and The Damned to Run the Jewels and Gwen Stefani. Elgort and James are given room to fall in lust. Their conversations are delightfully lofty, imbued with Wright’s signature epigrammatic wit and childlike romanticism. They speak of driving away, “in a car they can’t afford, with a plan they don’t have,” into the sunset. 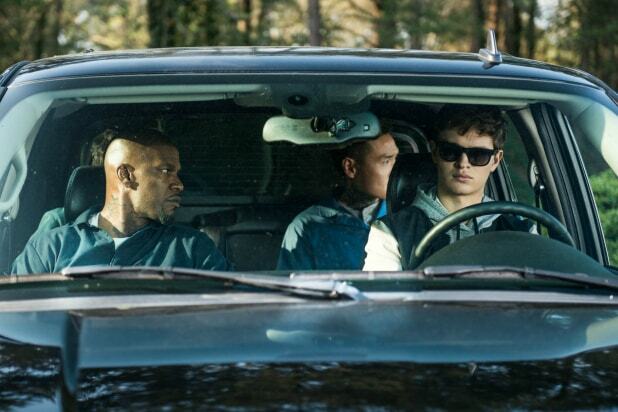 “Baby Driver” isn’t just blissfully uninterested in realism; it longs for fantasy. The movie exists in this dreamlike state of ecstasy for nearly 70 minutes. Then there’s a peculiar pivot into conventionality. Plot replaces story. Suddenly, we’re watching a heist procedural, but without the charm and zip of something like “The Sting.” Wright becomes interested in jumping down a hole of listless subplots. We’re presented with sundry antagonists whose motives are unclear and whose malevolence is lazily phoned in. Hamm and Foxx are given more screen time but less to actually do. Hamm, dashing as always, seems particularly thrown into a role that doesn’t contribute to the propulsion of the story. It slows it down. For the first time in Wright’s career, it feels as if he’s lost control of the wheel. The film is never quite able to regain its momentum. In fact, on further inspection, the dip in quality is jarring and uncommon; rarely do we see a filmmaker start so strong only to end with a whimper. All in all, though, “Baby Driver is still worth seeking out, if only for that first hour. Inside those opening 60 minutes is the best action-comedy of the last ten years — full stop — featuring a breathtaking amalgamation of rip-roaring combat, a star-making performance by Ansel Elgort, and a string of clever bits. By the end it’s a one-trick pony of a movie, but at least it’s a damn fine trick.